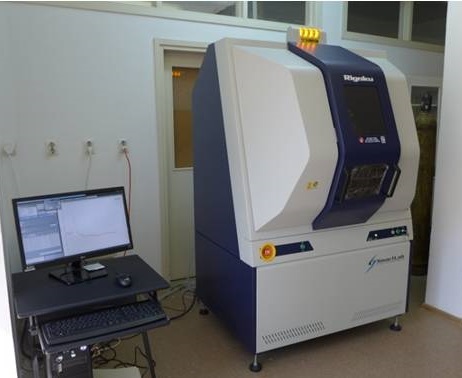 Rigaku Smartlab SAXS diffractometer in Magbiovin Labs was purchased from Austrian company Rofa, Rigaku’s representative for east Europe. Rigaku’s device setup concept relies on automatic recognition of any configuration change and device self-adjustment. Apart from essential components (generator, goniometer, tube), the offer includes CBO optics (both divergent and parallel beam available, on demand), vacuum channel for SAXS option, two-staged single crystal monochromator, as well as scintillation, silicone strip detectors that can be used interchangeably and Dtex 250 detector. The installation of the device was conducted between February 15th and 18th 2016. Prior to installation some additional technical conditions had to be met – installation of an additional air conditioning in the working area, thermal-sound isolation of the heat exchanger, as well as acquiring licenses for working with radiation source.